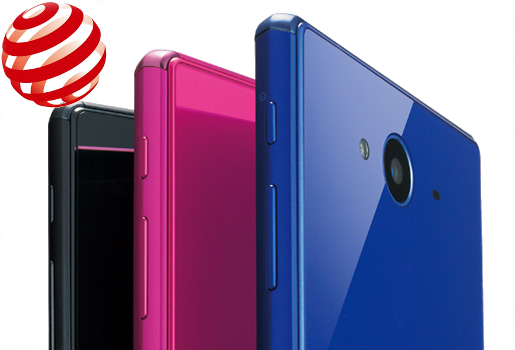 Docomo's Aquos Ever SH-04G and Aquos Zeta SH-01H received the internationally recognised Red Dot Product Design Award for 2016. The two smartphones were elected winners for best design innovations in the Communications category. Both the SH-04G and the SH-01H, as well as quite a few other models by Docomo, SoftBank, and KDDI, have the EDGEST design: a very narrow frame on three of the sides of the display, allowing for unprecedented screen to phone surface ration of 81%, significantly higher than any other brand's. This enables one-hand operation of large-screen phones – 5.0 inches on the SH-04G, and 5.5 inches on the SH-01H. The other award-winning feature of both phones is the HEXA GRIP SHAPE, dual-chamfered (diamond-cut) edges of the phone to yield a hexagonal form-factor of the phone's body. The HEXA GRIP guarantees that the phone will not slip out of your hand while using it, even with one hand. And while on earlier phones that featured the HEXA GRIP the side panel was plastic, it is now made of aluminium on the SH-01H, while the back is made from tempered glass. An earlier winner, the Aquos Crystal by SoftBank received the Red Dot Design Award for 2015, together with the iF Design Award for 2015.